In the Men’s Singles final of the Seamaster 2019 ITTF World Tour Platinum, Qatar Open MA Long of China will meet his compatriot LIN Gaoyuan. LIN beat Swede Mattias FALCK in the semifinal by narrow margin 4:3 (11:7, 11:9, 9:11, 9:11, 9:11, 11:9, 10:12). In the quarterfinal, FALCK overcame Tomokazu HARIMOTO of Japan also in seven games. In the same Round XU Xin overcame Patrick FRANZISKA of Germany 4:1, before MA Long halted his progress. 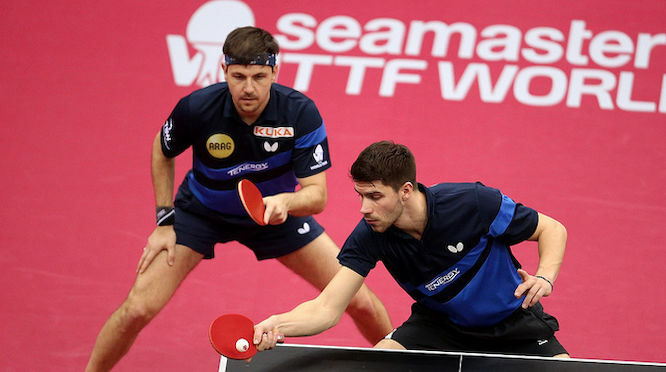 HO Kwan Kit and WONG Chun Ting of Hong Kong overcame Timo BOLL and Patrick FRANZISKA in Men’s Doubles final 3:1. In semis pairings from Germany beat Jakub DYJAS of Poland and Cedric NUYTINCK of Belgium 3:0. In the Women’s Singles semifinal all four players are from china; DING Ning will meet WANG Manyu whilst LIU Shiwen will meet SUN Yingsha. SUN Yingsha and WANG Manyu of China clinched the gold in Women’s Doubles.